If you’re an ecommerce retailer, the chances are that you’re already thinking about Christmas. The festive period can make or break a business year, and online sales are becoming an ever-more important aspect of this. Christmas 2015 was the busiest ever recorded for online retailers, and this trend looks certain to continue, with the IMRG predicting that 126bn will be spent online by the year end 2016. With the increasing importance of Christmas ecommerce sales – and the marketing campaigns driving them – we’ve reviewed some of the most impactful multi-media campaigns created by British fashion companies for Christmas 2015. John Lewis’ 2015 Christmas Campaign was very much focused around their “Man on the Moon” TV advert. The commercial sees a young girl sending a present – via balloons – to an old gentleman who’s otherwise had an extremely lonely Christmas. The £7m campaign highlighted the importance of “showing someone they’re loved” over Christmas, and was created in association with Age UK. “Man on the Moon” was released on YouTube, Facebook and Twitter simultaneously, as well as being published on John Lewis’ website, where a host of promotional activities were advertised. Amongst these were a Man on the Moon activity pack and app, as well as the chance to visit John Lewis’ “Lunar Lookout”, and to witness the moon via telescopes installed in-store. Debenhams’ Christmas 2015 strategy continued their 2014 “Found It” campaign, highlighting the satisfaction of giving and receiving gifts. Featuring the voices of celebrities including Dawn French, Sarah Millican and James Nesbitt, their several short TV adverts had a personalised, friendly feeling. These adverts were combined with an Instagram competition, as well as promotion on other social media channels, and through TV, radio, outdoor and direct mail. Debenhams also showed the advert on their main site Christmas page, and created “Found It” pages which and acted as entrance pages to various tailored gift collections. Adding a bit of humour to the mix, Harvey Nichols’ Christmas campaign was all about avoiding “Giftface” – the uncomfortable smile which we’re forced to pull when trying to look appreciative for a terrible present. Their TV advert showed a traumatised looking lady receiving a selection of gifts that she didn’t want, then trying her very best to look pleased with the monstrosities she was faced with. The advert was complimented with a social media campaign including “Giftface Tips”, product promotions and Gifs, as well as a tailored news page containing the advert, with viewers of the campaign directed to Harvey Nichols’ Christmas Boutique. House of Fraser’s Christmas campaign focused on the individual quirks which make every family’s Christmas a little different. With an ad showing people of various ages and demographics dancing to the hit song You Don’t Own Me by Grace and G-Eazy, the campaign was first released on Instagram, and described as “an antidote to festive fuzzy” in its deviation from traditional, whimsical Christmas marketing. In a classic content marketing approach, House of Fraser’s dedicated advert web page offered interviews, blog posts and how-to guides related to the commercial, as well as helping users discover clothing and accessories showcased in it. Again using popular music to freshen up their Christmas campaign – in this case including Mark Ronson’s “Uptown Funk” – Marks and Spencer’s “The Art Of Christmas” campaign was a vibrant, high-budget celebration of their product range. Interestingly first debuted to members of their “Sparks” loyalty scheme, M & S’ campaign – like Debenhams’ – comprised of a series of smaller ads, attempting to cater for mobile users’ shorter average viewing time. Some of these were specifically food oriented (excluded from this analysis), whilst others celebrated M&S’ non-food products. The ads were shared on Marks and Spencer’s Instagram, Pinterest and Facebook channels. In addition, the main ad was shown – along with selected Christmas gifts – on the company’s main site. Although initially risking a ban from the Advertising Standards Authority for blasphemy, the Mulberry 2015 Christmas campaign once again proved that the luxury brand has a great sense of humour. The Christmas TV ad shows a bag replacing the baby Jesus in a nativity scene, and was intended to mock capitalist culture, as opposed to the Christian faith – as some viewers believed. Mulberry created a dedicated page for the “Mulberry Miracle” campaign on their website, where the ad showed in full screen, and users could scroll down to read more of the Mulberry nativity story, as well as visit their Christmas gift section. For a page to earn genuine links, it must be seen as valuable by other sites. For this reason, the number that a company’s Christmas campaign page generates over the festive period – and the amount of domains that these come from – are important metrics for digital success. We used Majestic to carry out this measurement. The pages focused on here are those on each company’s site most closely associated with their Christmas marketing campaign. Each of these pages featured links to Christmas products, as well as the companies’ main Christmas adverts. Unsurprising considering the huge excitement generated whenever John Lewis release their Christmas commercial, their advert home page earned links from far more domains than any other analysed here. Whilst House of Fraser were on top in terms of overall links, these came from far fewer different sites. 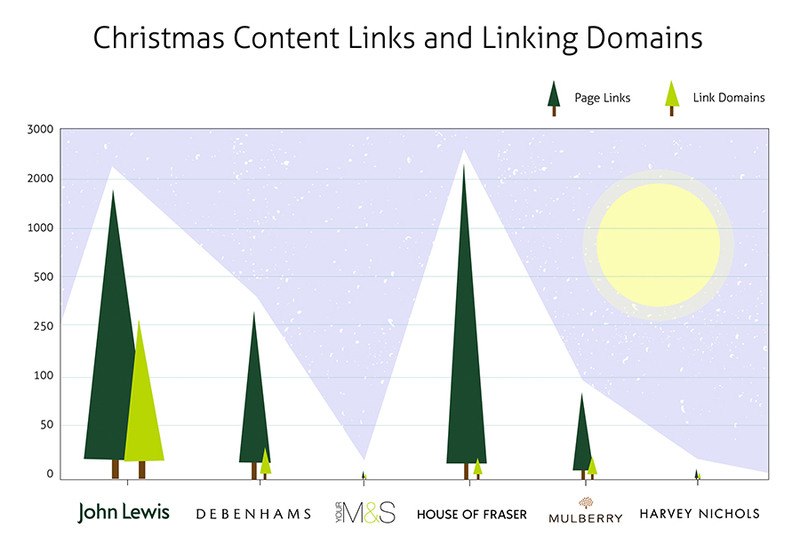 Both Debenhams’ main Christmas page, and Mulberry’s visually striking advert page performed fairly well here – with a good number of links, spread across a healthy number of domains. Both M&S and Harvey Nichols’ advert pages generated few links. The number of people who go out of their way to share a piece of content is a good indication as to whether it’s hit the mark with a target audience. Although social sharing is significantly related to a company’s existing following, this remains a metric that can be considered when gauging campaign success. For this analysis, we’ve reviewed the most socially shared page on each company’s site which relates to their Christmas campaign using Buzzsumo. 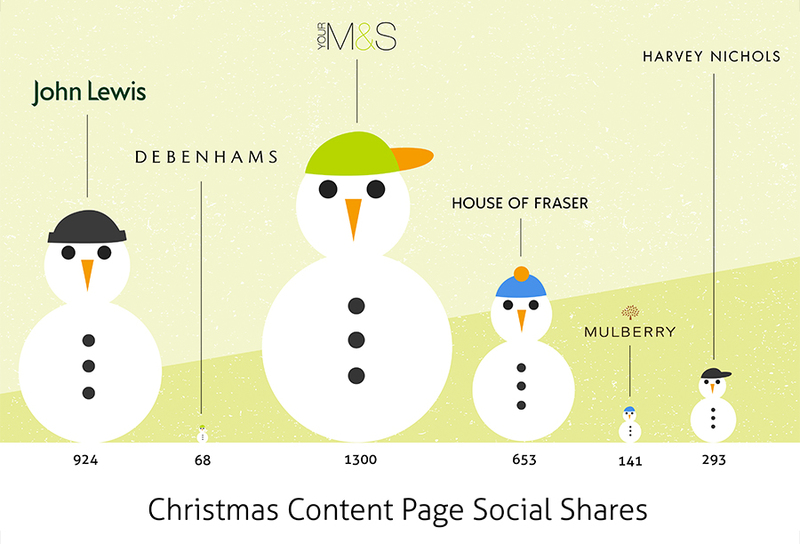 Interestingly here, it is not John Lewis but Marks and Spencer who had their site content socially shared the most over Christmas 2015, with their main Christmas page generating 1300 shares. House of Fraser performed notably well here – offering a wealth of Christmas-related content – whilst Debenhams’ Christmas URLs generated few social shares. We also reviewed the social shares that each company’s advert generated when published on YouTube. The results of this – again analysed with Buzzsumo – can be seen below. Clearly, whilst John Lewis’ on-site content didn’t generate the most shares, their YouTube video massively outdid their competitors analysed by this metric. The “Man on the Moon” video was shared nearly 700,000 times, was warmly received by the industry press from the outset, and was Tweeted 47,770 times within just four hours of its release. Again, Debenhams’ performance was weak here, whilst House of Fraser showed its campaign’s popularity with the second highest number of shares. Mulberry’s controversial ad performed well here, too, likely due to its comedy value. At the time of writing, the absolute number of views which each selected ad has received on YouTube is visualised below. For Debenhams and M&S, who both produced multiple Christmas videos, we have combined video views. Once again, it’s John Lewis who’ve stolen the show. 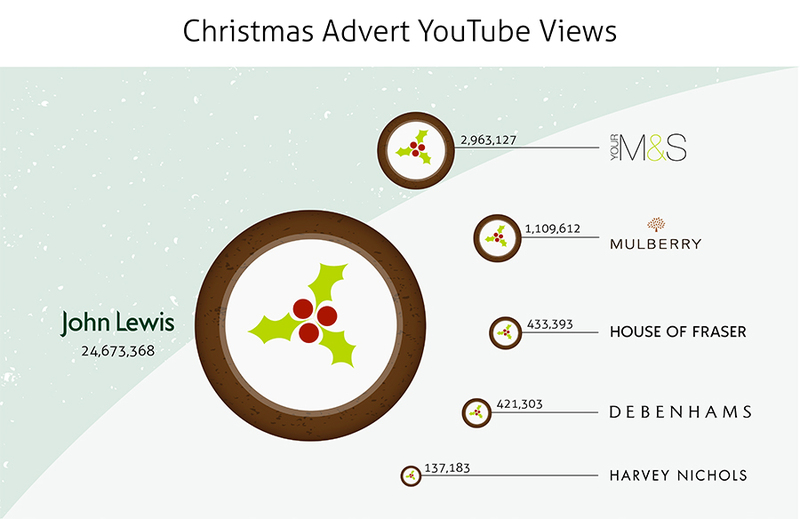 Interestingly, Marks & Spencer’s Christmas Ads generated a huge 2.96 million views on YouTube, despite only being shared 7,500 times. Following a completely different pattern, Harvey Nichols’ ad was shared a respectable 4,000 times, but viewed more than 20 times less. One metric for Christmas success is the extent to which you can drive customers to search for your brand over the festive period. Whilst this is something built over years (and may not just represent what was achieved in this campaign), it is a clue as to how much extra interest each brand achieves over Christmas. 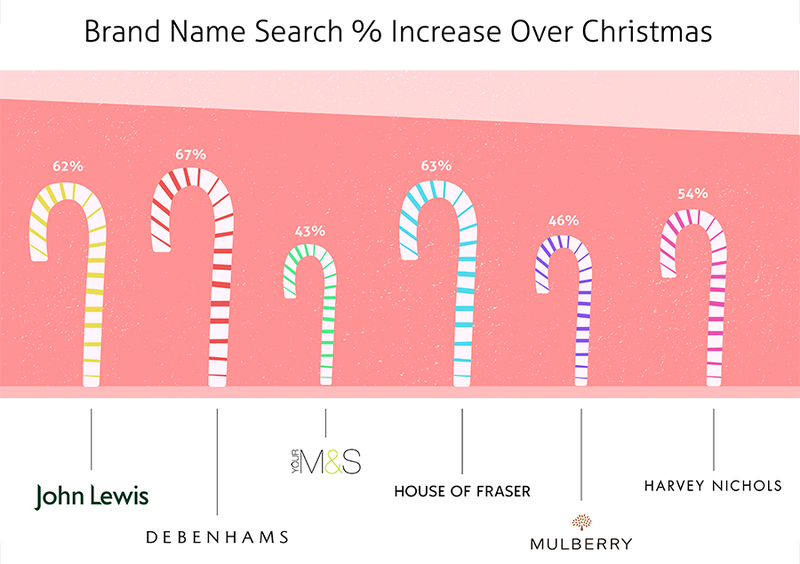 With the help of Google Keyword Planner, we’ve reviewed the percent by which searches for each of our selected brands (by name alone) increased over the festive season in 2015. By this metric, Debenhams performed best, followed by House of Fraser, with John Lewis a close third. The smallest rise in searches was experienced by Marks and Spencer, with Mulberry, too, achieving less of a rise in searches for their brand over Christmas. 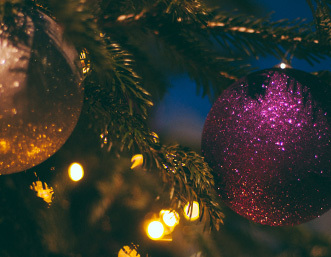 This metric combined the search volumes of each company’s Christmas-related brand queries over the festive period, in order to ascertain the number of people going out of their way to interact with companies’ Christmas campaigns or products. By this measure, John Lewis’ performance was stratospheric, so they’ve been excluded from the following graph. 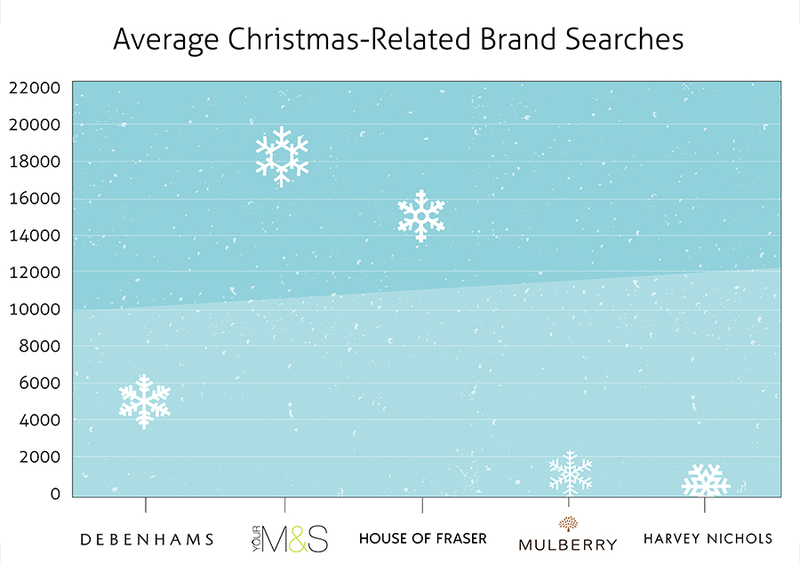 Their total Christmas-related brand searches were 12.9 times that of the other highest reviewed, Marks and Spencer. Here we can see a large interest in Marks and Spencer and House of Fraser’s Christmas efforts (including their advert, Christmas campaign and products), whilst Debenhams, Mulberry and Harvey Nichols generated fewer campaign-oriented searches. A Christmas campaign can only really be considered a success when it’s led to real, concrete sales increases. Below are the highlights of each focus company’s Christmas trading. The initial November release of the Man on The Moon commercial prompted a massive 15.8% increase in John Lewis’ sales from the previous week, and preluded a hugely successful Christmas. The full Man on the Moon campaign played a part in the company making an overall 5.1 per cent trading increase over the Black Friday, Christmas and post-Christmas periods. This high performance was in part caused by an upshot of online sales, which rose 21.4%. Debenhams’ 2015 Christmas performance was also significantly better than expected, as their like for like sales rose by 1.9%, and their online sales hiked 12.1%. These strong financial results led to the company’s stock price rising 15% following the news in January. There is little official information available about Harvey Nichols’ Christmas 2015 performance, but what is clear is that the company is facing a turbulent period. The luxury retail market has been one facing challenges in recent months, and Harvey Nichols profits fell 30% to March 2015, as sales plateaued since the following year. Over the same period, however, their online sales increased by nearly 27%, echoing research by McKinsey in October, which suggested that luxury ecommerce sales could triple in the next decade*. Whether online sales over Christmas 2015 have acted to salvage Harvey Nichols’ poor recent performance is yet to be seen. However, with their Christmas advert being voted the year’s most engaging by Campaign, they have certainly given themselves a good shot at standing out from their competition. House of Fraser’s Christmas sales were very strong. Their like for like sales rose 8pc over the vital Christmas period, including a 31.2% rise in online sales. Like John Lewis, House of Fraser noted the importance of Black Friday Sales to their Christmas 2015 performance. Marks and Spencer’s sales performance was weak within their Clothing and Home section between 2015 and 2016 as a whole, with a press release on their full year results ending April 2016 stating “sales performance unsatisfactory but actions under way”. Their 2016 report highlighted recouping this area of the business as a priority. In their annual 2016 report, Mulberry showed promising results. Their retail sales were up 8% to £118.7 million to the 31st of March 2016, with like-for-like sales up 8%. Within this, their digital business was highlighted as a strength with sales up 19%. Like Harvey Nichols, Mulberry could be a brand to benefit from a predicted increase* in luxury ecommerce sales. In an earlier interim report, the company pointed to the success of their “Mulberry Miracle” ad as a highlight of the year’s performance. Whether using comedy, useful content marketing, emotion or otherwise, the fashion companies reviewed here each took a very different approach to their Christmas marketing. John Lewis hugely stood out in terms of advert popularity and search volumes which – combined with blistering sales performance – proved the huge success of their Christmas strategy for another year. Their immersive advert hub page (similarly to that of Mulberry’s) was also a strong performer, without focusing overly on products. Debenhams experienced a large brand search increase over the festive period, outdid their sales expectations online, and achieved a healthy spread of links to their Christmas on-site page. However, their advert didn’t generate a large number of views or shares. Marks and Spencer’s gifting-oriented page was shared highly, and their ads, too, performed valiantly, despite not generating a high number of shares relative to their views. Their Christmas advert on-site page, however, performed poorly in terms of links. House of Fraser’s campaign performed solidly. Their Christmas advert page attracted a large number of links, and both this and their advert on YouTube were shared an impressive amount. Mulberry and Harvey Nichols each created striking campaigns, with their ads shared highly, and their on-site hub pages performing well in terms of relative shares too. Mulberry’s advert, in particular, generated a significant interest on YouTube, and their “Mulberry Miracle” page was linked to by a good number of separate domains. If you’re looking to drive your Christmas 2016 campaign success with the aid of either SEO, content marketing or both, get in touch with Erudite today. 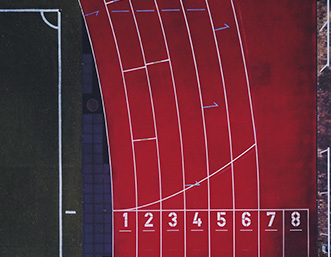 We’re experienced in driving revenue and visibility growth for both national and international clients, and would love to explore how we can help you meet your goals.